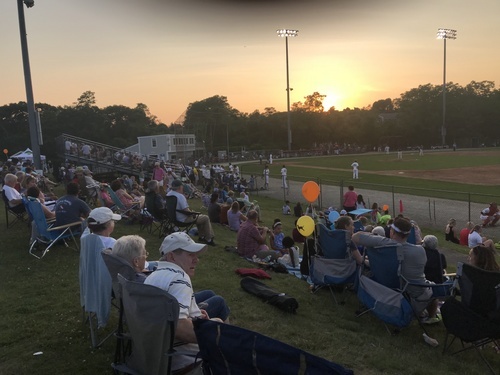 Thursday marked the final day of the 2018 CCBL regular season. Playoffs start on Saturday, and you can find all that information on the website. Falmouth put together a two-run second inning thanks to a home run from Alexander Volpi. Cotuit scored in four straight innings starting in the fourth with a Michael Toglia solo shot. In the fifth, the Commodores committed an error, allowing two Kettleers to cross on the play. Adam Oviedo homered for Cotuit in the sixth, and Trey Jacobs drove Toglia in on a single to right in the seventh. Falmouth was able to cross two in the top of the seventh thanks to an error. Both teams went cold offensively in the eighth and ninth, ending in a 5-4 score favoring Cotuit. The Sox shut the Hawks down, allowing five hits and just one run that came in the ninth inning on an RBI single from Liam McGill. Y-D got things going in the third with a bunt from Zach Ashford that was thrown away to score the first run of the inning. A Christian Koss sacrifice fly and an Andrew Daschbach single scored a couple more, making it 3-0. In the fifth, Andrew Daschbach doubled to left to score a couple more runs. In the ninth before Hyannis had a chance to hit, Y-D scored four more runs including a Koss RBI triple, another Daschbach double, a Luke Waddell RBI single, and Noah Campbell scoring on a wild pitch. Bourne struck first in the second with a Jake Garella double to score Ashton Bardzell. In the third, Wareham’s Austin Shenton hit a sacrifice fly to center to tie the game up. In the fifth, Shenton struck again, this time driving in a run via fielder’s choice. The next at bat, Jeremy Ydens blasted a three-run homer. Drew Millas later doubled in another run to make it 6-1. Bourne responded with a two-run single from Lyle Lin, and used a bases loaded walk to cut the lead to just two. In the eighth inning, the Braves took the lead and the final lead change on a Tyler Fitzgerald three-run homer, proving to be the game winner. Harwich brought a 3-0 lead into the fourth inning after a two-run homer from Andre Lipcius in the first and a sacrifice fly from Aaron Schunk in the third. Brewster found their way on the board with a solo homer from Justin Ammons in the fourth. But, Mariner Steven Passatempo hit a sacrifice fly to negate the run in the bottom half of the inning. A two-run single from Alex Tappen put Harwich up 6-1 going into the sixth inning. Brewster scored their last run of the game in the seventh on another solo shot from Brandon Wulff. The Mariners scored one more in the eighth on a Passatempo sacrifice fly to center to put the nail in the coffin for the Whitecaps. Chatham scored two in the first after Spencer Torkelson blasted a two-run shot. They scored another run in the third to take a 3-0 lead on a fielder’s choice. But Orleans responded with two runs thanks to a Eddie McCabe triple and an error that allowed McCabe to score. In the fourth, Firebird Pat DeMarco added another triple to the tally, scoring two more runs and claiming the 4-3 lead. Two more came in the fifth for Orleans thanks to a wild pitch and another fielder’s choice to take the three-run lead. In the seventh, Chatham crossed three runs including RBI singles from Drew Mendoza and Jake Taylor, and another scored on an error. After both teams scored one in the eighth to keep the game tied, and nobody scoring in the ninth, extra innings was forced. Chatham scored one on a John Rave RBI single to take the lead. But Orleans rallied together back to back RBI singles from JJ Bleday then Matt Frazier to walk it off 9-8.